Last week we finally moved the (stinky, oh-so-stinky!) chicks out of my basement and into the chicken coop. Hallelujah! We blocked off a section of the coop to keep them safe from the bigger chickens and let them wander outside for the first time the other day under close supervision. The baby chicks are teenagers now! They are eating tons of food and growing exponentially. They aren't quite old enough to lay yet, but they're getting there. We're pretty sure that the chicks were mislabeled and we ended up with one Buff Orpington (the lightest one in the middle) and two New Hampshire Reds (the two light brown ones on the right) instead of the other way around. They're always amusing to watch and the boys get such a kick out of them! 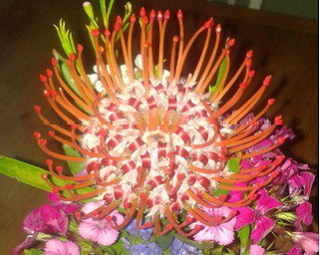 A friend got a free bouquet for signing up for a store credit card and the featured flower in the bouquet was a rather unusual blossom. Trying to figure out what it was, our guesses ranged from a fake flower inspired by either a sea urchin or Dr. Seuss, to one grown from alien spores that arrived here during a meteor shower. It turns out it's a real flower, very much from terra firma: a pincushion protea, native to South Africa and Zimbabwe. Nature is infinitely creative. It really adds something to the story when you can hear the music they heard and sang and that made up such a part of their culture and daily lives. I'm even number 1! I'm honored.